Darth Continent: Mah Knife Is Too Big! 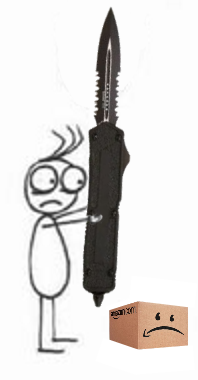 Mah Knife Is Too Big! REJECTED by Don Hertzfeldt is one of my favorite animated short films ever. Recently, I'd come across the video below, showcasing the Microtech Halo Giant OTF (out-the-front) automatic knife. "Mah KNIFE is too big!!"